Unless you have an extremely large budget, you will probably not want to fill your living room with playpen balls, as this will be quite costly. 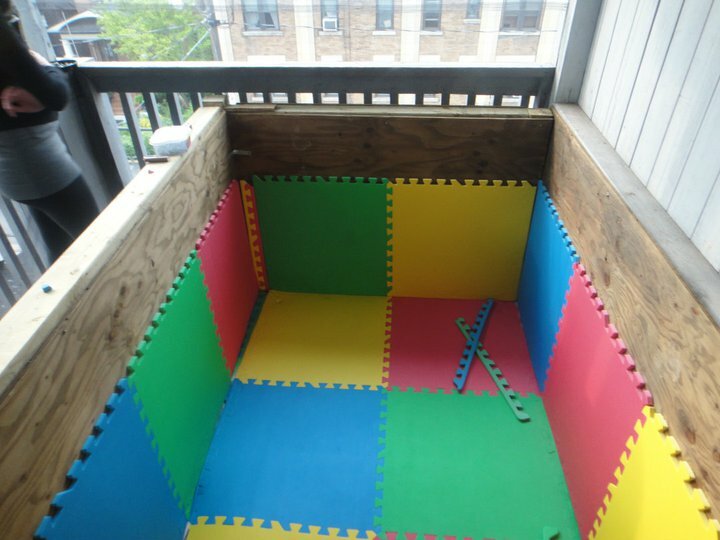 A small spare room or, as we’ve done, a balcony/patio area can be great because you can partition off part of the area for the ball pit, allowing you to keep the size (and therefore cost) to a minimum. If you’re choosing to use your balcony, be sure that it has a roof or that you will otherwise be able to seal the area so no balls to escape and no water or outside dangers (such as bugs) can get in. Also remember that the position of you ball pit is important for both safety and economical reasons. Building your ball pit in a corner, for instance, can eliminate the need for you to build two sides of your frame. Depending on the number of people you want to fit into it, partitioning a 4’x8′ section will give you plenty of space for 3-4 people to play in, or 1-2 people to really jump around in. 3′ tall should be enough for the average person to climb in and out of. You should also consider how deep you want your balls to be. We felt about 2.5 ft deep would be enough to immerse a seated person while still not feeling like you’re drowning in balls, or without them spilling over. This calculator, which has been very accurate in my experience, will help you estimate the amount of balls you will need and the approximate amount you should expect to pay for them. Using the calculator linked above, you will now know how many playpen balls you need to acquire. The number may seem large at first, as chances are that you – like most people – may have expected to only need a few hundred balls to fill your space. 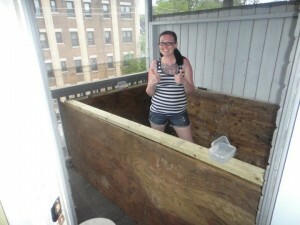 Trust the math here though: a 4’x8’x2.5′ ball pit will need well over 5,000 balls. Search online for cheap playpen balls in bulk. Ebay, craigslist, and kijiji are good places to find balls for cheap. If they are used, be sure to clean them. Wash them in your bathtub and/or spray them down with a one part bleach, nine-part water solution before putting them somewhere to dry. 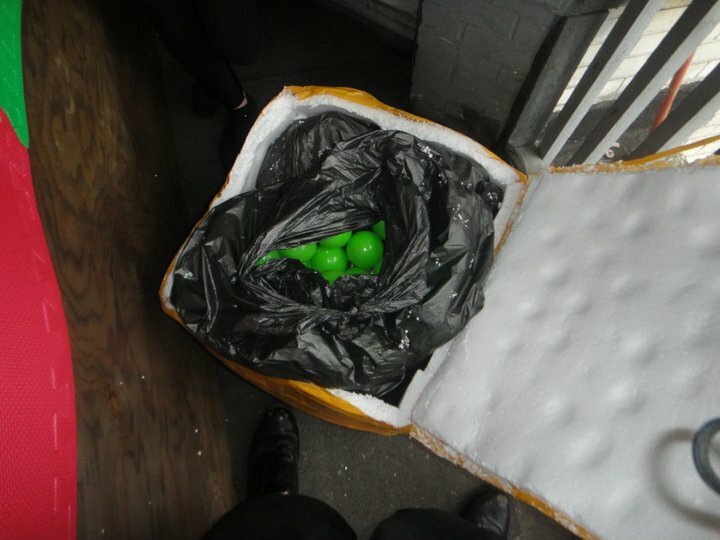 DO NOT PUT DAMP BALLS INTO YOUR BALL PIT. The last thing you want is your balls rolling all over the place. So be sure that you can somehow prevent them from either escaping the ball pit itself, or the area that the ball pit is located. If you are building your ball pit on your balcony or in a room with low windows, you will want to put up screen in any area where the balls could escape. Luckily, screen is relatively cheap at approximately $10/roll. The staple gun makes it extremely easy to tack up screen fast, especially if you are outside. If you are building on a balcony, you can screen in the entire area top to bottom, or you can just build the screen around the ball pit itself, leaving a hole or slit in the screen to allow you to enter or exit it. Your screen may come under a lot of stress while people play in your ball pit, so be sure to use a strong material. Chances are pretty good that you’re going to have drunk or otherwise easily excitable people playing in your ball pit. And really, what’s the point of having it otherwise? As such, you are going to want to make sure you’ve built yourself a sturdy frame. This is MOST IMPORTANT in the area you and your friends will use to get into and out of the ball pit. We used 8′ long 2″x4″ planks for the top and bottom and 3″ tall 4″4″ posts for the sides. Since people would be hopping over the sides to get into the ball pit, we wanted this to be extra sturdy. 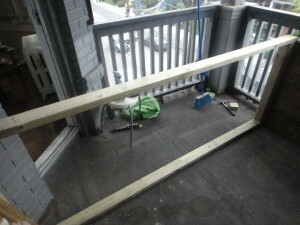 We hammered the frame together first, reinforcing it by adding l-brackets. Then we nailed large plywood boards to all four walls on the inside and the exposed walls on the outside. You can use more l-brackets on the inside corners of the ball-pit itself (these will be covered by the foam padding) to help keep the sides attached, and to keep the walls secured to your floor. Now you have a large, heavy wooden box. Not exactly the most fun – or the most safe – for you and your rowdy friends to play in. This is where the foam padding comes in. You can buy packs of 4 2’x2′ interlocking foam pads at Walmart for approximately $20 a pack. 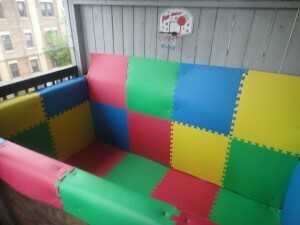 This is the perfect material for both the floor and walls of the ball pit as it is soft, durable, and easy to clean. 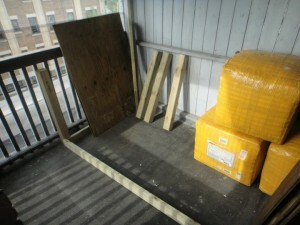 To cover the interior of a 4’x’3’x8′ box you will need 128 square feed of foam padding, or about 8 packs. Start with the floor of the ball pit first, locking all the pieces together firmly. Once the floor is covered, start your way up the sides, going around the bottom first, interlocking the pieces to the floor pieces as well. Glue the foam padding to the sides of the frame once you have them all positioned. Use large-headed nails (so they don’t just slip through the stretchy foam) to make sure the pieces stay in place. Once you have the bottom level done, you can go around the next level, gluing/nailing the pieces in place as you. By this time, you will have noticed that the padding stands higher than the wall of the ball pit itself. If you have used 2 2′ squared pads then you it should be 4′ tall standing up. 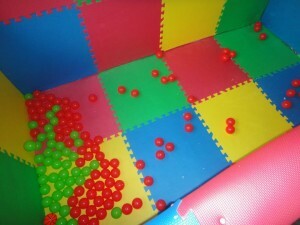 Since, your ball pit is only 3′ tall, that leaves you with an extra foot of padding to fold over the top of your walls, covering any sharp edges, nails, potential splinters, or anything else that you or your friends could hurt yourselves on while jumping around in your nearly completed ball pit. Around our house, my roommate Kayla has dubbed this process of hiding things your drunk friends can hurt themselves on as “Friend-proofing”. Step 6 – ADD THE BALLS! Without doubt the best step in these instructions. Just start pouring them in. If you can get a friend to pour them in while you lay on the bottom, I guarantee it will be an exhilarating, once-in-a-lifetime experience. Step 7 – Add Toys, Friends and Enjoy! A small basketball net is a MUST for any ball pit. Not only because it’s fun to shoot hoops with playpen balls, but because it will also give people something to throw them at other than each other… or you. Also, an inflatable shark just makes sense. 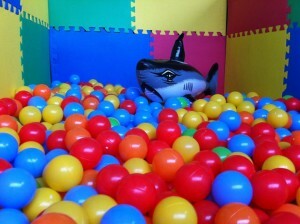 Every ball pit should have a shark in it. Now get into your colorful box of awesomeness, call all your friends, convince them that you have actually done this and aren’t just pulling their leg, and have a blast! When it does come time to clean your ball pit, remove them all the balls and store them in garbare bags. Clean the interior of your ball pit with any GENTLE cleaner that is safe to use on foam or rubber and be sure to give it ample time to dry before re-adding any balls. Take a few hundred balls at a time and wash them in your bathtub and/or spray them down with a one part bleach, nine-part water solution before put them somewhere to dry. DO NOT PUT DAMP BALLS INTO YOUR BALL PIT. Repeat washing, drying, and then re-adding your balls to your ball pit until all are clean. this is seriously awesome. bravo! Instead of using a bathtub full of water, you could just run a load of balls through your washing machine (clothes or dish..provided you don’t run a heated cycle). That would save both on water, time and space (go take a shower while the machine is running!). WOW! This is so amazing and I love your how-to! In college I had a kiddie pool with sand and dinosaurs in it and my friends and I decompressed by making sand castles and dinosaur worlds. 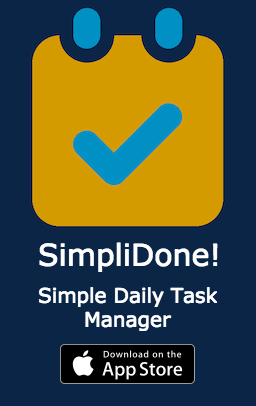 =) I would LOVE to link to your how-to if you didn’t mind! Dinosaurs in sand sounds like itwould be a lot of fun too! Feel free to link away! This is really wonderful! You can be able to have fun even though you are just staying inside your house. it is like your going back to the childhood days when all you do is to play. This is a nice bonding time if you have children around.